We are pleased to announce the GroupDocs.Comparison App which comes up with features to compare & view documents for more than 50 formats like Microsoft Office, OpenDocument, AutoCAD, Visio, Emails, Images & PDF with View, Download, Changes List, Comparison Summary and many more features. How to Compare the Documents? Just select or drag & drop your desired source & target files to upload. Click ‘Compare Now’, that’s it. Compare your files instantly without installing anything. More than 50 formats like Microsoft Office, OpenDocument, AutoCAD, Visio, Emails, Images & PDF. View & changes list with each change type. Zoom page view by percentage (%) & Fit page view to Width & Height. Paging: Move to Next & Previous page with Current & Total page count. Download original source & target documents. 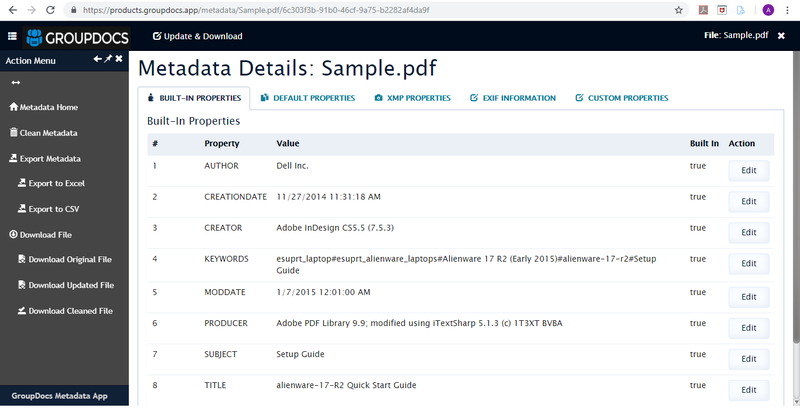 Download compared result document as target document format. Download compared result document as image format. We always appreciate and welcome our valuable users to share their feedback to improve this application. We will be happy to know your thoughts and suggestions. Just create a forum thread and our dedicated support team will be there to respond. 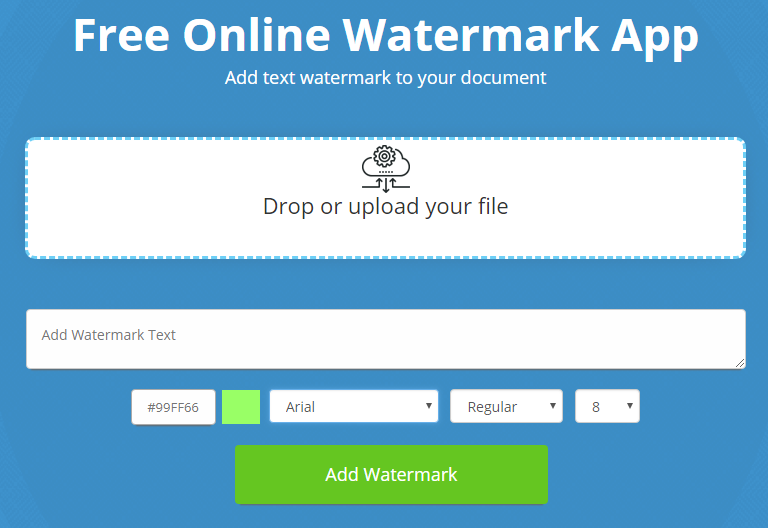 We are pleased to announce the new Free Online GroupDocs.Watermark App. The app can be used from any modern desktop or mobile browser including Chrome, Firefox, Internet Explorer etc. Using free online App, you can easily add text watermark to DOC, XLS, PPT, VDX, PDF, and 20+ more business document formats. Easily watermark images including WebP, TIFF, JPG & PNG. Add text Watermark to PDF, Microsoft Office and Visio Formats (Word, Excel, PowerPoint & Visio) and Image documents (Portable Document Format, Open Document, Email & Images) using any browser. Instantly download or send output file as an email. Drop or Upload your file. Select Font Style, Font Family & Font Size. Click on “Add Watermark” button. If you have any trouble using the app or get an error, leave us a message in forum and we will get back to you. You can also post suggestions, questions or feature requests there. Our dedicated support team will be there to respond your queries and solve any issues. groupdocs.app offers free online document manipulation apps to view, convert and edit metadata of almost all popular business document and image file formats including: PDF, Microsoft Word, Excel, PowerPoint, Outlook, Visio, Project, OneNote, HTML, OCR, AutoCAD and many others. Simply upload or drop the file online to instantly perform the required operation. You can download the processed files directly or deliver within the email address you provide. GroupDocs.Viewer App allows viewing all common document file format online from any browser on any platform: Windows, Mac, Android and iOS without requiring any plugin or software installation. It supports viewing more than 90 types of document and image formats including PDF, Microsoft Office, OpenOffice, Project, Emails, Outlook, AutoCAD and many others that are commonly used in day to day business. Users can view document pages as thumbnails, print it directly or download the file in original, PDF or image format. Read more details here. We are pleased to announce the GroupDocs.Metadata Editor App which comes up with features to view & edit metadata information for more than 50 formats like Microsoft Office, OpenOffice, Project, Emails, Images & PDF with View, Edit, Clean, Export Metadata and many more features. How to View/Edit the Document Metadata? Just select or drag & drop your desired file to upload. App will automatically redirect to Metadata Editor App, that’s it. View your files instantly without installing anything. More than 50 formats like Microsoft Office, OpenOffice, Project, Emails, Images & PDF. Download original or cleaned metadata information document. Export metadata information to Excel & CSV. We are pleased to announce the GroupDocs.Conversion App which comes up with features to convert between more than 50 formats like Microsoft Office, OpenOffice, Project, Emails, Images & PDF with Instant Download & Email Download Link and many more features. Just upload your desired file, choose the desired output format and click on the “Convert” button. The file will be converted and you will get the download link instantly. You can also provide your email address, we will send you the download link. Convert your files instantly without installing anything. More than 50 formats supported like Microsoft Office, OpenOffice, Project, Emails, Images & PDF. Send converted document link to email. We are pleased to announce the GroupDocs.Viewer App which comes up with features to view more than 90 formats like Microsoft Office, OpenOffice, Project, Emails, Images & PDF with Downloads, Zooming, Paging and many more features. How to View the Documents? App will automatically redirect to Viewer, that’s it. Supported formats：Microsoft Office, OpenOffice, Project, Emails, Images & PDF. 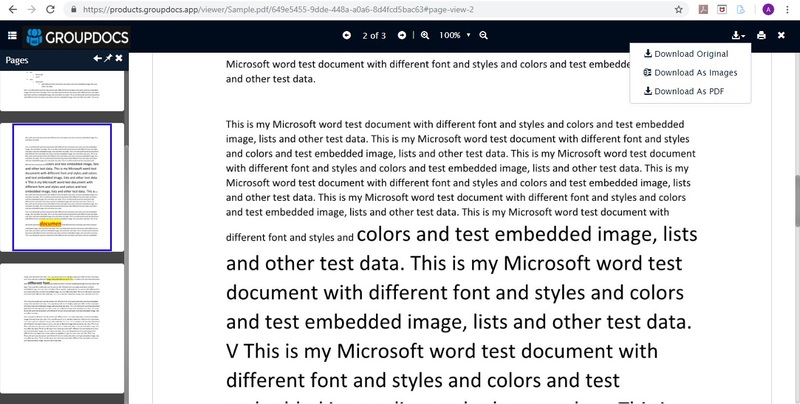 View document pages as partial rendering for better document page rendering. Download document in original or image format. Download document as PDF format. At the start of the new year 2019, we present some more free Document manipulation Apps for you. These apps follow the same pattern of aspose.app, which means these are absolutely FREE, no Ads and on top that we offer free technical support. Creating good user experience is one of our top priorities. You will not find our pages loaded with Ads or marketing material. We will never ask you for your email before using our free apps. If you want to view a document, just upload it and it will instantly open. 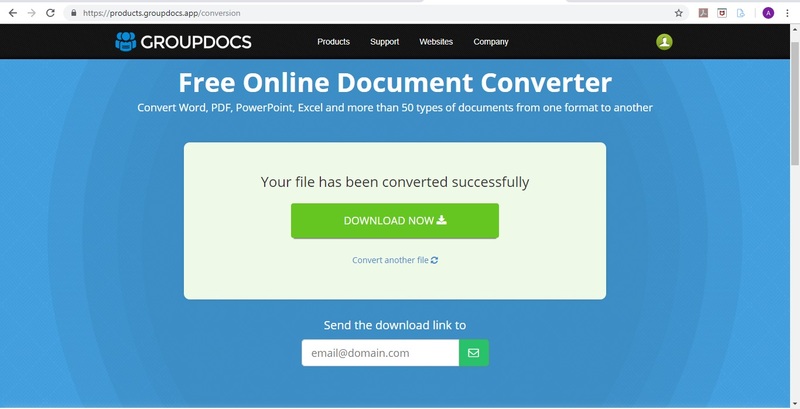 If you want to convert a document, just upload it and choose the save format, it will be instantly available for download. Which document formats we support? All our apps are based on software built by Aspose, which is the leading software vendor in file formats category, with numerous industry awards and Fortune 500 clients. We support the following document formats. Microsoft Office – Word, Excel, PowerPoint, Outlook, Visio, Project etc. The post would be crowded if we start to list details of the formats. For specific document format, please visit Free Document Viewer, Conversion and Metadata apps. If you have any trouble using the apps or get an error, leave us a message in forums and we will get back to you. You can also post suggestions, questions or feature requests there. we will try our best to answer your queries and solve any issues. You can also find us on Facebook, Twitter, LinkedIn and YouTube. Visit us, like us and share if you love our apps.